Ballot papers for COTA members in Sodexo, Aramark, ESS, Trinity and Entier have now been issued. 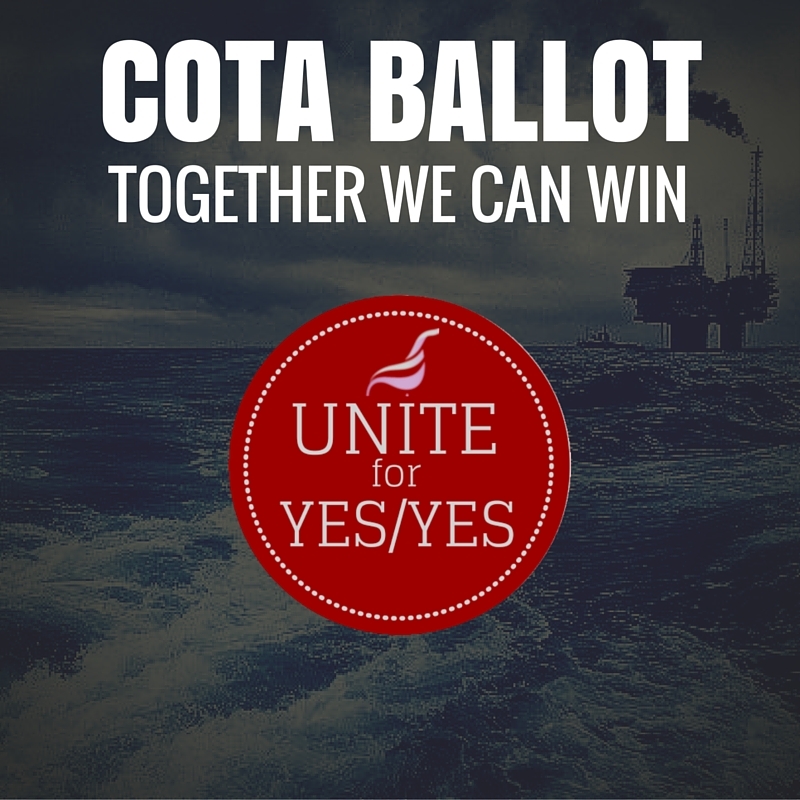 The COTA branch of Unite are recommending a YES vote to both questions on the ballot paper. Iain Mundie, Branch Secretary of the Unite Offshore Catering Branch issued the following message to Unite members taking part in the ballot. By voting Yes to both questions on the ballot you are sending the strongest possible message to your employer that you do not accept their removal of the pay offer. Voting Yes/Yes is the best way to protect the rest of your terms and conditions too. If we make a stand now, and at least send a clear message that this is not acceptable, then it will put us in a stronger position in the future. Vote YES to both questions on the ballot paper to stand up for your rights offshore. For all those affected by this pay cut, come along to the branch meeting for catering, auxiliary and admin Unite members. Come along to the upcoming COTA Branch Meetings to find out more about the current dispute, to have your say and discuss the issues that matter to you and your colleagues offshore. Recently, trade union members working for Aramark were victorious in their dispute over unpaid holiday pay. These workers and GMB members work as hostesses and domestics at the Maudsley Hospital in Camberwell. They were facing a loss of annual leave through management’s failure to allow staff to book their holidays appropriately. The union members returned a 97% vote in favour of industrial action in a consultative ballot followed by a formal industrial action ballot. Upon receiving notice of an official ballot Aramark were quick to address the members concerns and agreed to reimburse the leave that had been lost. In the above example, the employer was forced back to the negotiating table by the threat of strike action. That’s the most important lesson we can learn from the story of these union members. In delivering a strong mandate for action, it was enough to send a clear message to the employer that these actions were simply unacceptable. This is why we’re asking our members to vote Yes to strike action on the ballot paper, as well as action short of a strike. For offshore workers in Aramark- as well as Sodexo, ESS, Entier and Trinity- it’s important that, in order to win, that we send a clear message to the COTA companies. Ripping up the second year of a two year pay deal is not acceptable. The dispute outlined above tells us that if we get organised, hold our nerve and stick to our guns, that we can win. These companies are huge multi-nationals- so for them to rob the lowest paid workers offshore of their negotiated pay deal is completely unacceptable. If you are prepared to stand up and stand together with your offshore colleagues, then the employers’ actions are not inevitable. Vote Yes/Yes on your ballot paper. Unite has notified employers in the Catering Offshore Trade Association (COTA) that it will ballot its members across the agreement for industrial action. Ballot papers have been sent out to members in Sodexo, Aramark, ESS, Trinity and Entier. Our dispute centres on the refusal of COTA employers to honour a modest pay agreement for the second year of a two- year pay deal, worth around 1.3 per cent. We are recommending that members who receive their ballot vote YES/YES to both questions. Unite are seeking a large mandate for action offshore, so we need as many members as possible to vote YES/YES and return their ballot papers. The ballot itself will run for six weeks, closing on Wednesday 21st of October. The long ballot period is to give as many members as possible to return their vote. However, its important you return your vote as soon as possible. Vote YES to action short of a strike, and vote YES for strike action. We need to stand up and fight back now. Sometimes we can feel lucky just to have a job, but if these companies get away with ripping up a fair and reasonable negotiated pay deal, how long will it be before they come for the rest? If they get away with this now, they will soon come for our terms, conditions and basic rights. The attack on pay will only be the beginning. So we need to tell employers that we, the lowest paid workers offshore, are absolutely not prepared to bear the brunt of the fall in the price of oil. Our pay deal was fair and should be honoured. If we are goingn to have a sustainable industry in the North Sea, respect must be given to those who make it operate, who make it habitable and who make it safe. We deserve this respect. We deserve fair pay. We deserve better. Vote YES/YES. Unite Regional Officer John Boland said, “The point blank refusal of the COTA employers to honour our pay agreement has left us with no choice but to proceed to a formal industrial action ballot. Unite have approached the OCA confirming that Unite members have taken the democratic decision to reject the proposals. Unite confirmed our campaigning position that our members decision would be final. This newsletter is to advise you an informal meeting with the Chief Executive and Chair of the OCA has now taken place and the OCA have met with their Board to consider their response. The OCA have now advised Unite that they are unable to offer further improvements to the offer confirmed in their letter of 19 June 2015. In particular they confirmed that they were not prepared to make alterations to their offer in regard to “equal time” (three on, three off rotas). The OCA have reiterated they value the Agreement and the stability it has enabled over the past 16 years and that they are available for further dialogue. However, given the indication they are not prepared to change their views, our commitment to our membership is clear. This process will be closely scrutinised and our preparations will be critical in protecting you and ensuring the ballot cannot be legally postponed. We can fully expect the companies to use every legal means possible to try and stop our ballot. Unite organisers will be undertaking a major exercise to ensure that your voice is heard and not suppressed via legal battles. Many Unite members will have been contacted by a Unite Organiser and updated their personal details. There is a great deal of truth in the old saying that there is ‘strength in numbers’. We need as many workers in the North Sea to join Unite, to be ready to take part in the ballot and to tell colleagues to do the same. The oil companies and employers might seem strong, but when we all stand up and stand together, we can win. Unite is the largest and most organised trade union representing off shore workers. We need to have a strong membership to fight back against these attacks on our pay, jobs, terms and conditions- so if you’re already a member, ask a co-worker to join today. Make your voice heard, become part of the fight back that is needed to change the industry and to secure a better future off shore. Stronger together, stronger offshore, stronger in Unite. You can join online at http://www.unitetheunion.org, speak to one of the unite organisers at the heliports for a membership pack. Yesterday, Unite protested the pay cuts for COTA workers in the Offshore Industry. The withdrawal of the negotiated pay deal promising a raise of 1.3% is actually pay cut in real terms, as the cost of living goes up and workers wages are frozen. Notice of the ballot was served to employers last week, and papers will begin to be sent out on Friday 11th September. 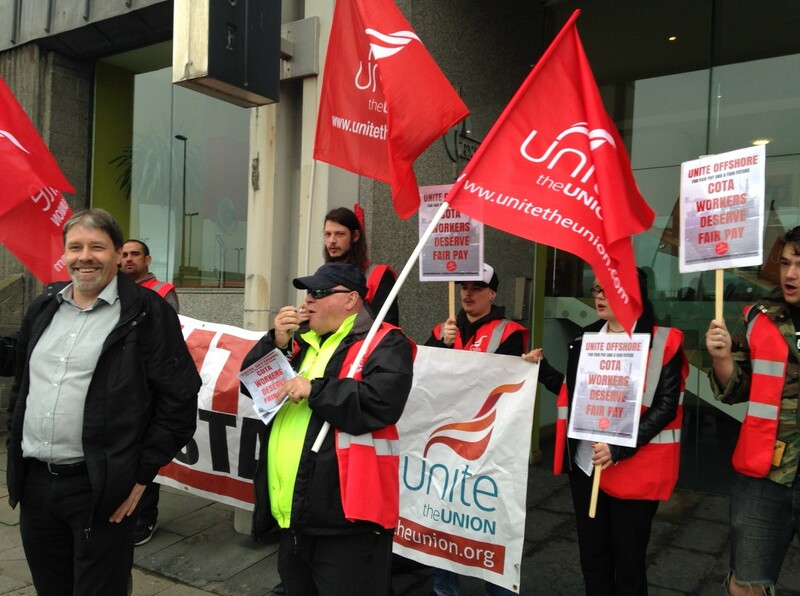 Below: Unite protesting outside Sodexo Headquarters in Market Street, Aberdeen. Unite has notified employers in the Catering Offshore Trade Association (COTA) that it will ballot its members across the agreement for industrial action. The dispute centres on the refusal of COTA employers to honour a modest pay agreement for the second year of a two- year pay deal, worth around 1.3 per cent. All COTA employers, including soft services giants Sodexo, ESS and Aramark, have now been served with a statutory seven day notice for the ballot start period and the ballot itself will run for six weeks. Industrial action and an offshore strike, the first in a generation, would impact significantly on the delivery of catering and ancillary services on rigs across the UK Continental Shelf (UKCS). “Even against the backdrop of oil price volatility and industry pressure the profits of the COTA employers’ run into billions and it is unacceptable that our agreement negotiated in good faith is now being ignored. “We are giving our members a clear recommendation to vote ‘yes’ for action short of a strike and ‘yes’ for strike action in order to secure the strongest possible mandate to defend their terms and conditions against the industry’s imposition.